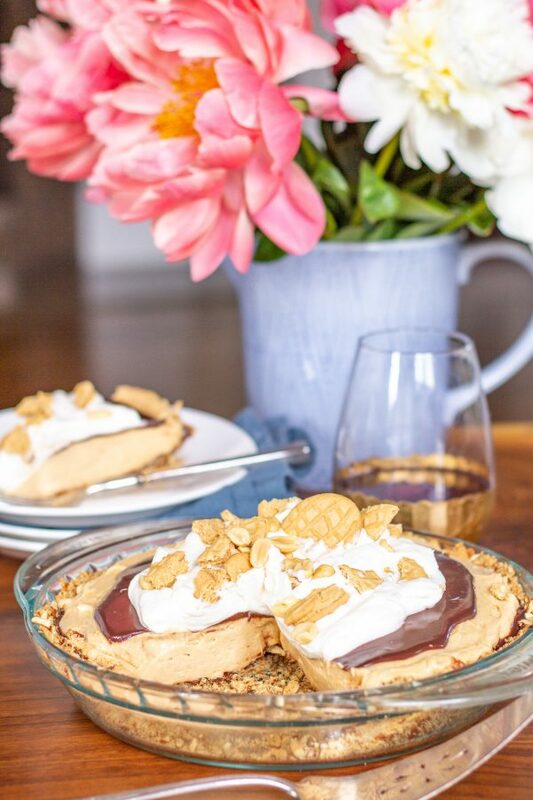 This Chocolate Peanut Butter Pie combines creamy peanut butter, rich chocolate, and light fluffy whipped cream in a salty pretzel crust. 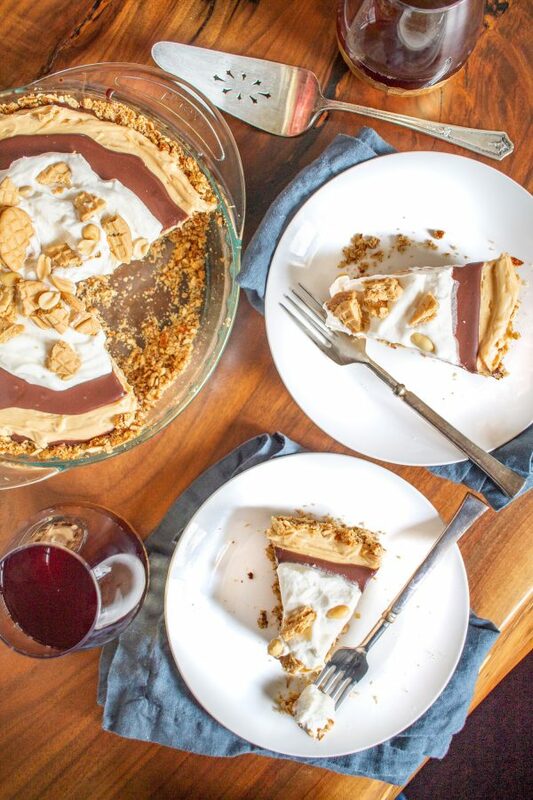 The best thing is that this pie comes together in just minutes. 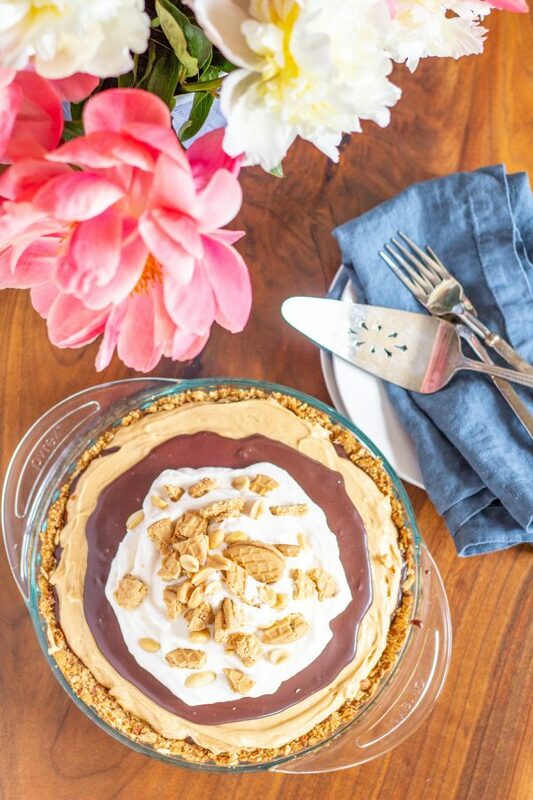 You are going to love this Chocolate Peanut Butter Pie. 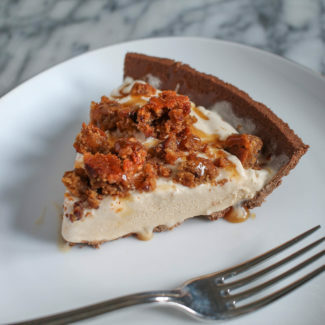 The peanut butter pie filling is light and creamy and it is perfectly paired with chocolate ganache and whipped cream. 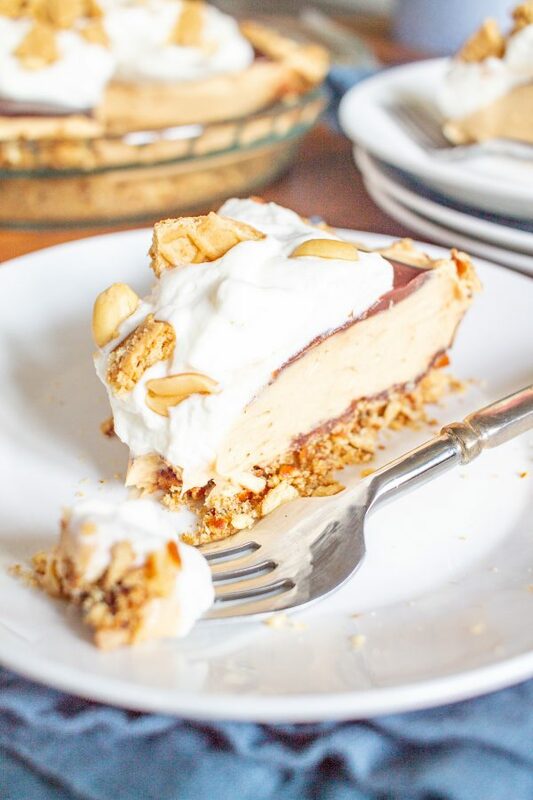 The pretzel crust adds a saltiness that balances out the sweetness of the peanut butter pie filling, while also giving a nice crunchy texture to the dessert. Even though Charles isn’t the biggest fan of peanut butter, he still loved this dessert. 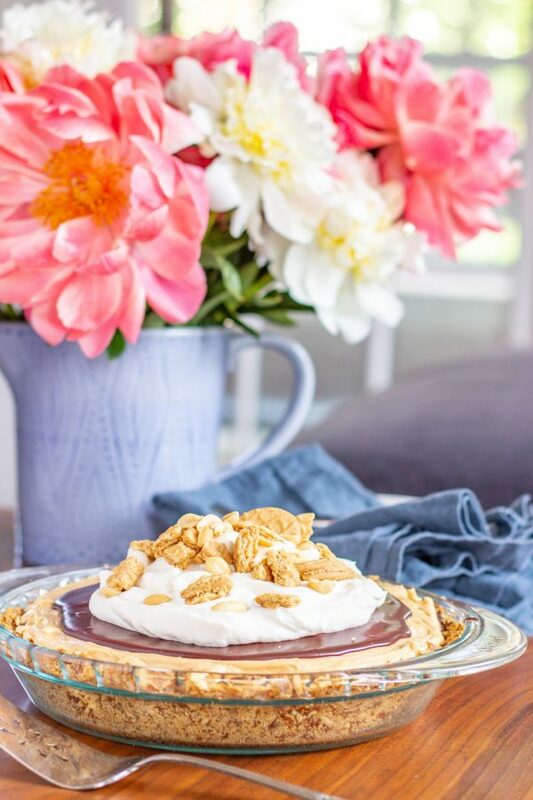 The process of preparing this pie is simple. Pretzels get pulsed in a food processor and mixed with melted butter and brown sugar. Then you press the mixture into a pie pan and bake it for 12 minutes. 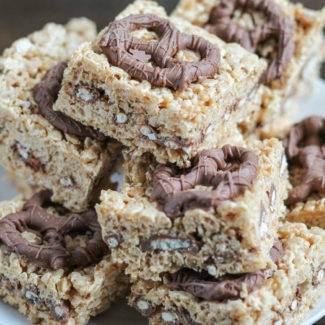 I loved the saltiness from the pretzel crust – but if you skip the pretzel crust and use a store-bought graham cracker or oreo crust this becomes a no-bake recipe. 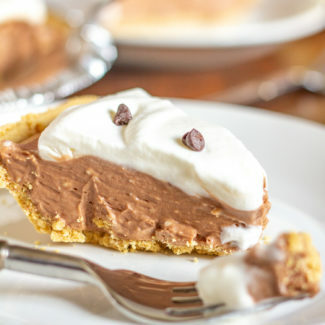 While the pie crust is baking, you prepare the ganache by heating cream in a microwave and whisking in chocolate chips. Then you whip the peanut butter filling together in an electric mixer. The entire process takes just about 10 minutes. 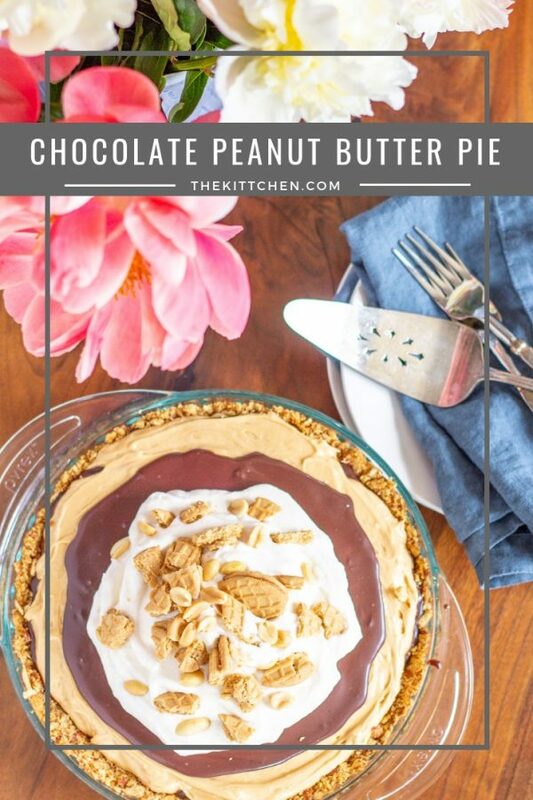 Once the pie crust is ready, add a layer of the ganache, the peanut butter filling, and another layer of ganache. The pie needs to sit in the fridge for at least 2-3 hours before serving. 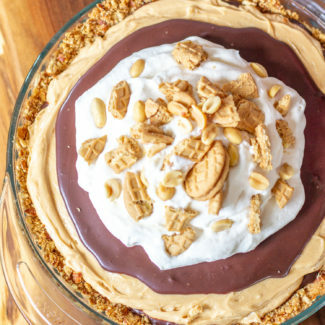 Just before serving, I garnished the chocolate peanut butter pie with a layer of whipped cream, peanuts, and crushed Nutter Butters. 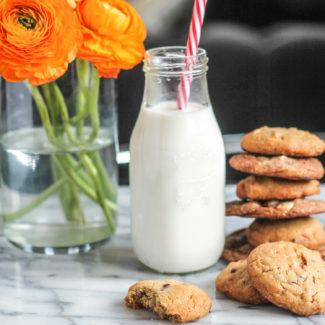 I liked how the peanuts and crushed cookies adding a hint of crunch to the dessert. 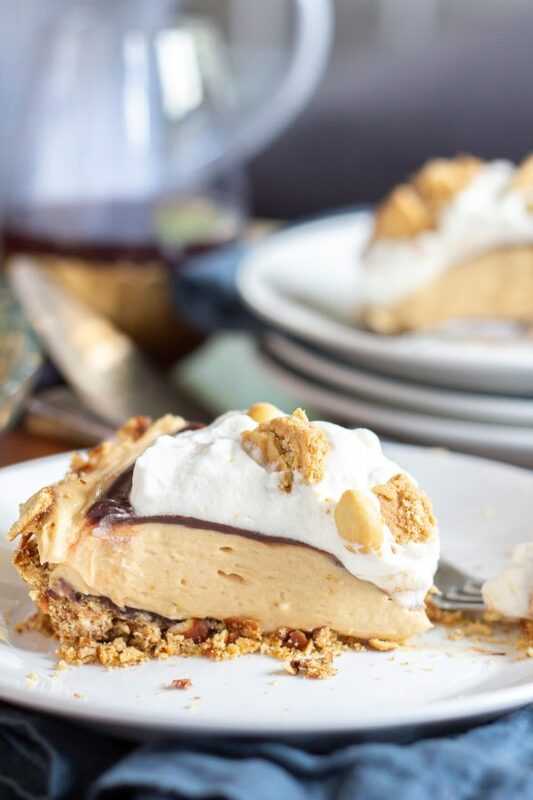 You could just use whipped cream, which helps to balance the richness of the chocolate and peanut butter and skip the extra garnishes if you want. Place the pretzels, melted butter, and brown sugar in a food processor, and pulse until the pretzels are crumbs. Then press into a pie pan and bake at 350 degrees for 12 minutes. While the crust is baking, prepare the ganache. The easiest way to do this is to pour the cream into a microwave-safe bowl and to microwave until the cream is just starting to bubble. Then remove from the microwave and whisk in the chocolate chips. After a couple of minutes, the ganache should be smooth. Once the pie crust has baked, pour a thick layer of the ganache over the pie crust and then place the pie crust in the fridge to cool. As the ganache sets, combine 1 1/2 cups heavy whipping cream and 1/4 cup granulated sugar in the bowl of an electric mixer. (Save the remaining cup of whipping cream for later). Whip on a medium speed until the cream forms soft peaks. Then add the cream cheese, peanut butter, 1 cup powdered sugar, and 1 teaspoon of vanilla. Beat together until smooth. Pour the peanut butter pie filling into the pie crust. 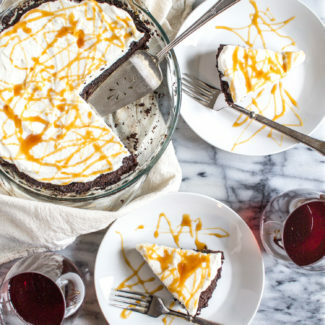 Top with ganache (you might not use all of it), and then place the pie in the fridge to chill for at least 2-3 hours before serving. Just before serving, whip the remaining whipping cream, powdered sugar, and vanilla together using an electric mixer. Once soft peaks form spread the whipping cream over the pie. 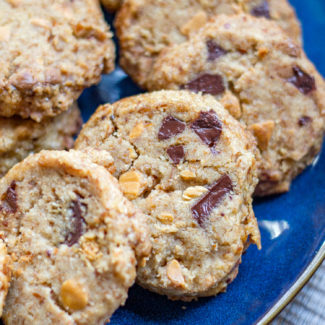 Top with peanuts and crumbled nutter butters and serve.